When we’re stressed or in danger, our adrenal glands produce hormones to allow us to think and act faster – this is a built-in survival mechanism that has been in our make-up since mans’ creation. The downside is that stress causes fluctuations in adrenal hormones particularly adrenaline and cortisol. Too much cortisol long-term starts converting blood sugar to fat, which is why many of us start to gain weight when we are stressed. Unfortunately, with the stressful nature of our lives these days, our adrenal glands are creating a lot more cortisol and our levels don’t always get a chance to balance out. So how do we stop these constant surges that are responsible for storing fat? We de-stress. Everyone relaxes in a different way, so do whatever works for you. Go for a walk, read a book, re-connect with nature – whatever it takes. Certain foods and drinks also elevate your cortisol levels. These include, chocolate, coffee and anything high in sugar, so limiting your intake of these will help too. Low thyroid function can sometimes be attributed to a nutritional deficiency. Iodine, selenium, iron, zinc, and copper all naturally support thyroid function, so including foods that contain these in your diet could help (Brazil nuts for example are a great source of selenium). In extreme cases, hormone replacement therapy may be advised. Your healthcare professional will be able to help you identify whether your thyroid gland is an issue, and advise you on the next steps. This is the hormone that tells your brain when you are full. The right amount of leptin will keep your appetite in check, but too much de-sensitises the receptors in your cells. As a result, you eat more than you need to because your body doesn’t register that you’re full. Cutting down your sugar intake will help to keep your leptin levels balanced. When you eat sugar, the excess that isn’t burned by physical activity, breathing or digesting gets turned to fat, which is then stored in your liver or abdomen. This hormone does the opposite to leptin – rather than making you feel full, it sends signals to your brain, telling it you need to eat. Too much ghrenlin leads to over-eating due to the constant signals triggering your appetite, which subsequently causes weight gain. Ghrenlin levels rise when we are sleep deprived, so getting a good night’s sleep will help to keep your ghrenlin levels (and your weight) under control. These two hormones work together to regulate your blood sugar levels. When your body is functioning properly, your blood sugar levels will gently rise and fall, giving your body energy when you need it and conserving it when you don’t. Think of insulin and glucagon as two people sitting on a see-saw; when one rises, the other falls. Glucagon is the hormone that stops your blood glucose levels from dropping too far. Around 4-6 hours after eating, most people experience a dip in blood glucose levels. This signals the pancreas to produce glucagon, which breaks down proteins and fat, releasing them back into the bloodstream as glucose. On the opposite side of the see-saw is insulin. When we eat foods that contain carbohydrates, glucose levels rise. This is where insulin comes in. As our blood glucose levels rise, insulin stimulates cells around the body to absorb glucose from the blood stream, which then use the glucose for energy. The problem is, when we eat more glucose than our cells can absorb, the excess glucose gets stored as fat causing gaining weight. The trick is to limit your carb intake, so that there isn’t an excess of glucose to be stored as fat. Oestrogen in one of the primary female hormones; but the right balance is important for maintaining healthy weight. An excess of the oestrogen can actually contribute to weight gain and is pretty common nowadays. This is partly due to the high levels of xenoestrogens found in our environment. Xenoestrogens are a group of chemicals with oestrogen-mimicking properties. These are found in food and many products in our environment such as disinfectants, dry cleaning fluids, pesticides, drugs, cling wrap and polystyrene. Problems arise because these xenoestrogens bind to our oestrogen receptors in the body, disrupting our own hormonal balance, causing oestrogen dominance or an overload of these toxic oestrogen-mimicking hormones. 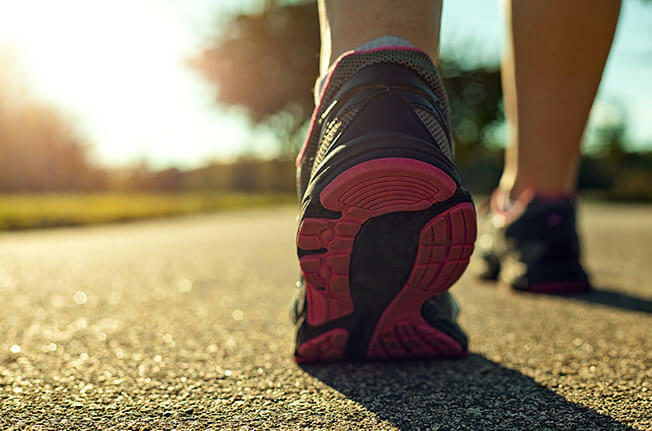 Daily exercise will help to keep your oestrogen levels healthy, even a brisk walk for around 20 minutes a day can do wonders. A healthy diet, exercising regularly, getting enough sleep, actively de-stressing and avoiding excessive exposure to xenoestrogens (as much as possible) will all help. If you’re concerned about your hormonal balance or hormone levels, consult your healthcare professional to help develop the best plan of action for you.